Romak are denture specialists. Since our inception, we have developed a client roster of over 200 dentists nationwide and made or repaired over 100,000 dentures at our well-equipped modern laboratories. EverSmile WhiteFoam uses patent pending EverClean™ technology which whitens and cleans using proprietary surfactants, solvents and hydrogen peroxide. EverClean breaks up and loosens large organic stain particles responsible for discoloration of teeth and dental appliances. Hydrogen peroxide fuels this reaction while simultaneously whitening and brightening. 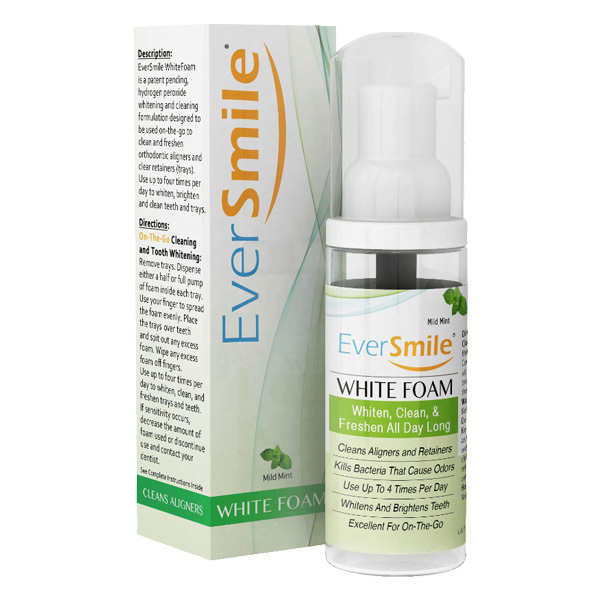 EverSmile WhiteFoam whitens and cleans with virtually no tooth or gum sensitivity and can be used up to four times per day. Unlike tooth whitening gels, EverSmile WhiteFoam whitens and brightens teeth without altering the fit of aligners and retainers. Wear your aligners as directed by your dentist and WhiteFoam will whiten your teeth the entire time. Click here to purchase from our denture products shop. © Copyright 2019 Romak Denture Centre. All rights reserved.